Remarkably, less than a year after the Idaho State Office of Rural Health (ID SORH) set a goal to find new funding for a physician loan repayment program, the state legislature appropriated $640,000 annually for it. 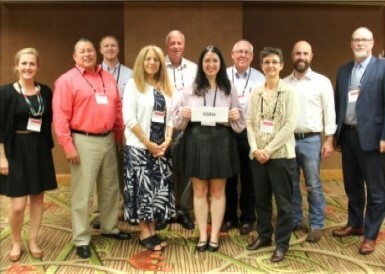 Mary Sheridan (third from left) with the Idaho team that attended the NCSL meeting last June. That opportunity was a three-day meeting in June 2017, convened by the National Conference of State Legislatures (NCSL), on “Challenges and Innovations in Rural Health Policy.” Sheridan attended the meeting along with three Idaho state legislators, the Primary Care Office Program Manager, and deputy administrators from the Division of Public Health and Division of Medicaid. The NCSL event, funded through a cooperative agreement with the Health Resources and Services Administration, included presentations from rural health policy experts and state-specific team meetings for developing collaborative action plans to improve rural health. Idaho was one of eight states attending. “Our team there identified three goals: securing reimbursement and funding for community paramedic programs, securing funding for loan repayment, and expanding telehealth,” Sheridan said. “Afterward, the team typically met monthly to share updates and progress on all project goals. The on-going support from NCSL post-meeting was truly helpful in moving the loan repayment legislation forward.” Members of the team are currently working on the other two goals, Sheridan said. It was a team effort that got the loan repayment legislation to the floor in the next (January 2018) legislative session. “One strategy was for me to provide a presentation on loan repayment and physician shortages to the Idaho legislature’s Health and Welfare committees,” Sheridan said. “Team members made it happen. They worked with legislative leadership to schedule it on the calendar and NCSL actually came to that presentation and lent their support. The Idaho Medical Association worked actively with legislators on the issue and it went from there.” A legislator who was on the team introduced House Bill (HB 472) to fund the loan repayment program. “It’s remarkable how fast it went, especially when you realize this is the first time we’ve ever had state funding for loan repayment,” she said. HB 472 provides state funding for the Rural Physician Incentive Program (RPIP), a program that already existed but which had been paid for with student fees‑Idaho students attending out-of-state medical schools in Washington and Utah at in-state tuition rates had been assessed $1,600 per year, which went into the RPIP fund. In order to qualify for loan repayment, physicians must work in a Health Professional Shortage Area (HPSA) in Idaho and receive up to $25,000 per year for four years. According to the Idaho Physician Workforce Profile, Idaho has a significant shortage of primary care physicians, ranking 49 out of 50 states for physician workforce. “Approximately 98% of the state is designated as a HPSA for primary care and dental, and 100% for mental health,” Sheridan said. “So loan repayment is hugely important for us, and is certainly a tool for recruitment and retention of physicians in rural and underserved communities.” NCSL estimates that the $640,000 loan appropriation will fund about six more physicians per year, more than double the current number.